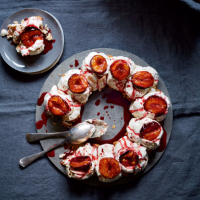 This Christmas twist on a classic pavlova has real 'wow' factor. It's also a delicious alternative for those who aren't fans of traditional Christmas pud. 1. Preheat the oven to 140°C, gas mark 1. Line a baking sheet with baking parchment and, using a plate or pan lid as a template, draw a 28–30cm circle on the parchment with a pencil. Turn the paper pencil-side down. 2. In a clean bowl, whisk the egg whites with an electric mixer until stiff, then add the caster sugar a teaspoonful at a time, mixing well between each addition, until really stiff and glossy. Fold in the chopped hazelnuts. 3. Using the pencil circle as a guide, spoon the meringue onto the baking sheet in 12 spoonfuls that just touch to create the wreath shape. Make a shallow hollow in the top of each one with the back of a spoon. Bake for 1¾–2 hours until pale golden and crisp. Turn off the oven and leave the meringue inside to cool completely, then remove. 4. Preheat the oven to 180°C, gas mark 4. Place the plum halves in a shallow dish or roasting tin. Scatter with the mixed spice and muscovado sugar and drizzle with the orange juice. Cook in the oven for 15–20 minutes until the plums are tender. Leave to cool. 5. Transfer the meringue wreath to a board or flat plate, or prop up as a centrepiece. Serve topped with the whipped cream and plums. Make the meringue wreath and store in an airtight container for up to 1 week. Roast the plums and chill for up to 48 hours in advance. Allow to come back to room temperature before serving.